Proud parents. Indeed we are a proud parents seeing our little boy before is now growing up. 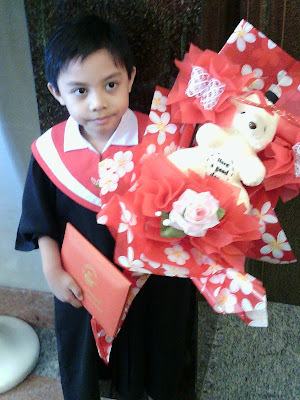 Last few days ago he graduated from his kindergarten and next school year he will be in Grade 1. Time flies so fast and we just didn't realize how grew up that fast. He is now leveling up his knowledge and his world in education. 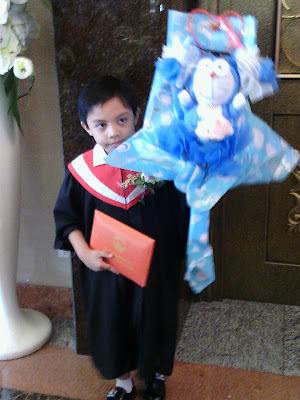 We just hope and pray that he will have also development in his study habit. Before he is not really interested in studying. Or I think in his young age of 6 years old he didn't came across taking seriously on his schooling. But I believe one day he will realize how important education is in his life.